Jonathan Lehoux is proud to announce that Lakeroad Hedge Fund Lakeroad, one of Canada’s top performing alternative fund manager, has been awarded the Investors’ Choice Award for best Emerging North America Equity Long /Short fund of 2014. The awards were judged by a distinguished panel of institutional investors in funds taking into account a set of qualitative criteria covering the investment process, risk management framework and depth of research team, as well as a set of quantitative performance measures including annualized returns, volatility and maximum drawdown. Lakeroad representatives were present at the Pierre Hotel in New York at the awards gala dinner to receive their award from the hands of Scott Wapner, host of CNBC’s Fast Money Halftime Report. 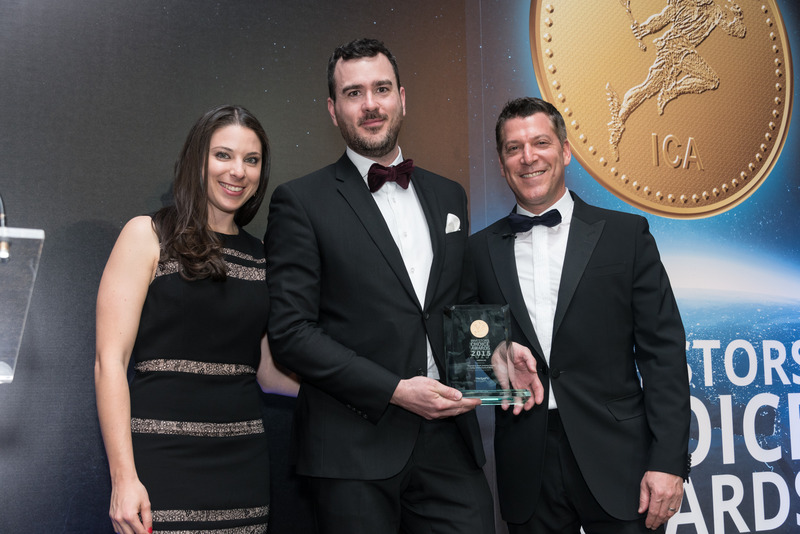 Antonin Giroux, in the middle, receiving the Emerging North America Equity Long / Short Fund of 2014 prize at the Investors’ Choice Awards 2015.